The trip I look forward to all year long is the annual trek to Bristol Bay Alaska and a fly fishing float on one of the great rivers there. Since my first trip in 2010, I’ve gone every August for a couple of weeks. The fishing is phenomenal, the Char, Rainbow Trout and Grayling become laser focused on the spawning Pacific salmon and the subsequent egg drop. 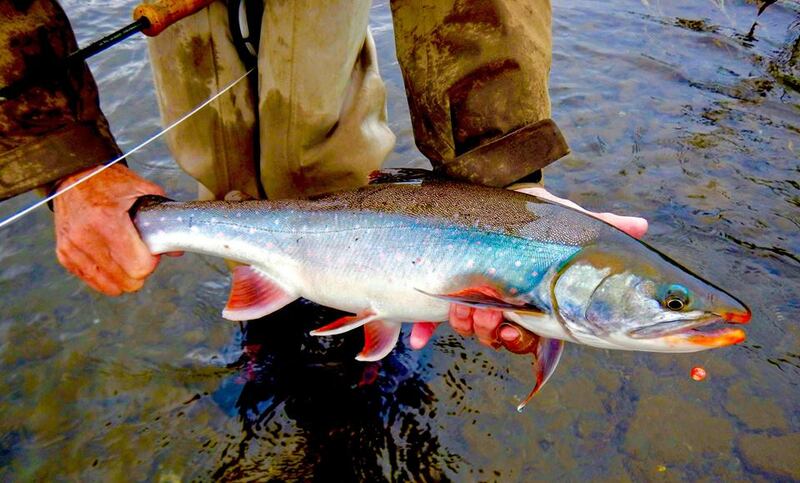 Find a pod of spawning salmon, Sockeye, King, Chum or Pink and guaranteed there will be many game fish below eager to pounce on any stray eggs that drift down in the current. A strategically drifted bead in the right size and color will result in a hookup, every time. Adding a bead to a fly pattern will make it twice as effective! Prior to discovering Stone Cold Beads, I used plastic. Size and color were right on, but the HUGE advantage Stone Cold Beads offered was weight. A wonderful selection of colors and the non-toxic nature of the product is an added bonus. The wheels began to turn. Two Fly Fishing applications shine. The first was to incorporate a Stone Cold Bead into a Dolly Lama style fly to develop the ultimate ‘egg sucking leech’. I took an Intruder shank, slid on a Stone Cold Bead, a smaller tungsten bead and some turns of wire to hold it all in place. Then tied a Dolly Lama as usual. This takes an already effective fly over the top. The second is to ‘peg’ a Stone Cold Bead in front of my #1 Bristol Bay fly, the Megawatt. Not only does the bead weight add to the deadly jigging action of the fly, the bead also adds focus for the fish. Literally, almost as soon as it hits that water they’re on it. Last August a friend and I spent twelve days floating the Goodnews River in late August. We never saw another soul until the last day. The water was as high as I’ve ever seen, the fishing was crazy good. I had just been turned onto Stone Cold Beads and fished them in the patterns as described above. The results were spectacular. This coming summer I float the Arolik and Kwethluk. I’m fully prepared this year with Stone Cold Beads, and I’m very confident the fishing will be outstanding!